Mark Tapson: Is the Right Underestimating Ocasio-Cortez? The 30-second clip of Ocasio-Cortez dancing uninhibitedly to an irresistible drumbeat was actually snipped from a longer video filmed while she was a student at Boston University, not in high school. She may have been “20 or 21,” said Eric Calvin Baker, a 2013 Boston U. alum who helped make the video as an homage to the dance scene from the 1985 cult film favorite The Breakfast Club, for the university’s Howard Thurman Center for Common Ground. “We were student ambassadors at the Howard Thurman Center, and Sandy [Ocasio-Cortez’ nickname] was like the face of the Center,” Baker told HuffPost. The apparent attempt to embarrass Ocasio-Cortez backfired bigly. Far from depicting a “know-it-all acting like a clueless nitwit,” the video shows an attractive Ocasio-Cortez twirling and bouncing joyfully to the music, alone and with friends. Absent any political context, the video is nothing more than carefree fun, and people on both sides of the political aisle were charmed by it. 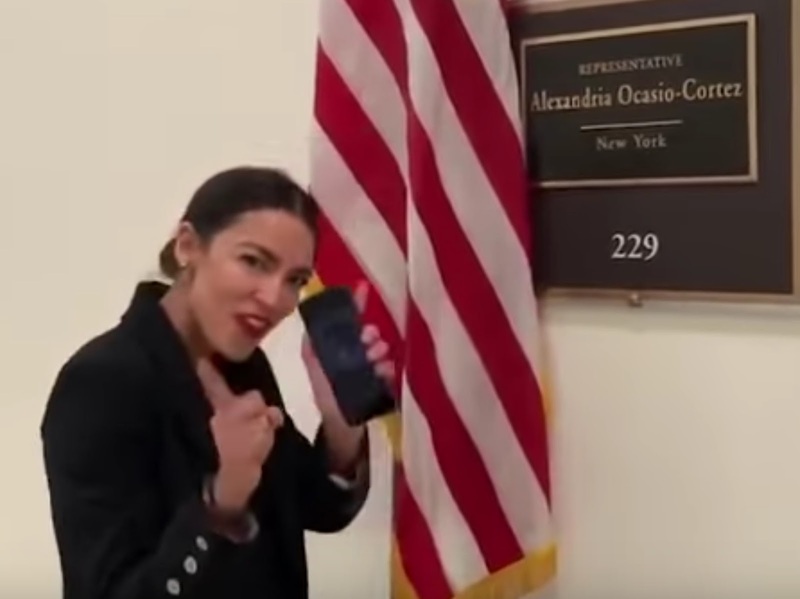 “I don’t get why the video of AOC is supposed to be embarrassing,” tweeted Jonah Goldberg. “She looks like an attractive young person dancing and having fun doing it.” Washington Post columnist Karen Tumulty wrote, “Newly unearthed video reveals that when @AOC was in college, she was... adorable.” The AnonymousQ1776 account has since been deleted, and skeptics suspect that the video may not have been posted by a presumed rightwinger, but leaked by the left or even by Ocasio-Cortez’s team itself, to embarrass Republicans. The media narrative now is that conservatives have been “driven crazy” by the video, despite there being precisely zero outrage about it on the right (“Conservatives up in arms about Ocasio-Cortez getting footloose,” reads the headline of one article, which cites not a single example of a conservative up in arms). Regardless of the video’s source, it demonstrated that Alexandria Ocasio-Cortez possesses a vital political weapon: she is likeable, even to fair-minded conservatives. For better or worse, likeability is a compelling factor in politics, and Ocasio-Cortez doesn't have to fake it. Her youthful exuberance and attractiveness go a long way toward overriding, in many people’s minds, her intellectual shortcomings. Contrast Ocasio-Cortez’s charm power with 2020 presidential hopeful Elizabeth Warren’s cringeworthy attempt to connect with voters in her own recent video, live-streamed from her kitchen, in which she inauthentically announces, “Hold on a second – I’m gonna get me a beer,” and proceeds to pop open a cold one as if she is an actual, regular person kicking back after a long day at the office. This disaster, in combination with the debacle of her nonexistent Native American ancestry, may have scuttled Warren’s presidential run even before it got started; social media was abuzz over her obviously calculated beer drinking and down-home wording. “Nothing says ‘relatable woman of the people’ like awkwardly using a phrase that some consultant picked out for you because it ‘sounds folksy,’” wrote Buck Sexton on Twitter. The video’s failure was compounded by the fact that it was in apparent imitation of Ocasio-Cortez’s own effortless live-streamed videos, particularly one from her kitchen in which she rustles up some mac-and-cheese while singing along with a pop song. Warren is only slightly more sympathetic than the humanoid Hillary Clinton, whose range of human emotions runs the gamut from icy rage to volcanic rage. Her propensity for gaffes aside, Ocasio-Cortez crushes them both in terms of likeability, and at 28, the youngest woman ever elected to the House of Representatives has literally decades to get her political act together. Conservatives are enjoying poking fun at the perceived airhead Ocasio-Cortez now, but it will be a politically fatal error to underestimate her in the long run. In as little as seven years when she becomes age-eligible to run for POTUS, she could very well be in a position to have a go at the White House. If that sounds absurd, keep in mind that her supporters in the media such as Vox’s Matthew Yglesias are already arguing that the constitutional age limit on the presidency is “ridiculous,” and that President Trump should be “relieved” she can’t run in 2020. The left has the highest hopes for her; with the right backing and prepping, by the time she is eligible, or shortly thereafter, Ocasio-Cortez could be a bigger rock star to the left than Barack Obama was in 2007.